Continuous Improvement (CI) is a term we hear a lot lately. Sadly, despite knowing the term and possibly even applying CI principles to some aspects of operations, CI principles are infrequently applied to in-house job and familiarization training. This is a mistake. First, it is neither difficult nor expensive to establish and maintain a program of CI for in-house training. Second, there is a good chance that if you do ignore CI, not only will your training outcomes fail to improve, but they will likely deteriorate, resulting in a deterioration of safety and operational performance. After all, if you are not applying improvement principles, you are unlikely to be measuring outcomes. This is a recipe for deteriorating performance. The good news is that it is easy to begin implementing a program of continuous improvement in your training. Even a modest program can yield significant results. Once such s program has been launched, it can then be gradually and incrementally expanded making it more effective and more sophisticated. The improvement in training outcomes, trainee satisfaction, safety and performance can provide a tremendous return on investment given the low cost and effort of implementing such a program for operational training. 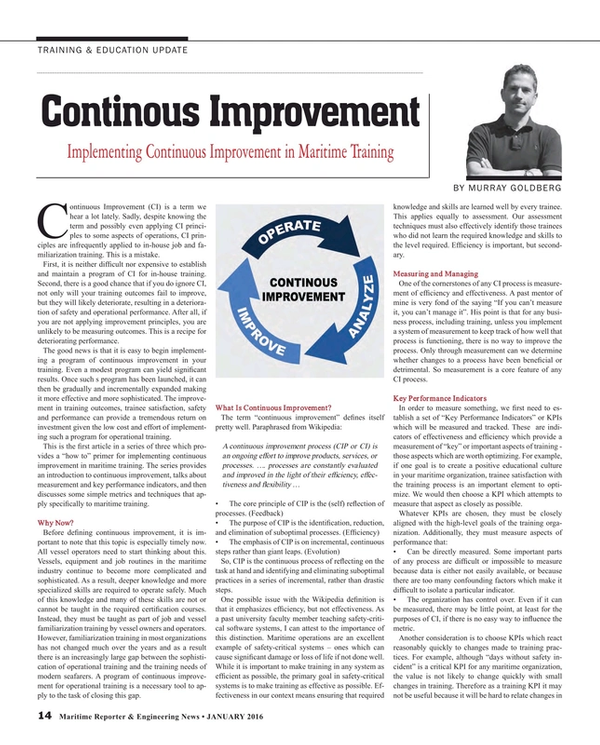 This is the first article in a series of three which provides a “how to” primer for implementing continuous improvement in maritime training. The series provides an introduction to continuous improvement, talks about measurement and key performance indicators, and then discusses some simple metrics and techniques that apply specifically to maritime training. Before defining continuous improvement, it is important to note that this topic is especially timely now. All vessel operators need to start thinking about this. Vessels, equipment and job routines in the maritime industry continue to become more complicated and sophisticated. As a result, deeper knowledge and more specialized skills are required to operate safely. Much of this knowledge and many of these skills are not or cannot be taught in the required certification courses. Instead, they must be taught as part of job and vessel familiarization training by vessel owners and operators. However, familiarization training in most organizations has not changed much over the years and as a result there is an increasingly large gap between the sophistication of operational training and the training needs of modern seafarers. A program of continuous improvement for operational training is a necessary tool to apply to the task of closing this gap. So, CIP is the continuous process of reflecting on the task at hand and identifying and eliminating suboptimal practices in a series of incremental, rather than drastic steps. One possible issue with the Wikipedia definition is that it emphasizes efficiency, but not effectiveness. As a past university faculty member teaching safety-critical software systems, I can attest to the importance of this distinction. Maritime operations are an excellent example of safety-critical systems – ones which can cause significant damage or loss of life if not done well. While it is important to make training in any system as efficient as possible, the primary goal in safety-critical systems is to make training as effective as possible. Effectiveness in our context means ensuring that required knowledge and skills are learned well by every trainee. This applies equally to assessment. Our assessment techniques must also effectively identify those trainees who did not learn the required knowledge and skills to the level required. Efficiency is important, but secondary. One of the cornerstones of any CI process is measurement of efficiency and effectiveness. A past mentor of mine is very fond of the saying “If you can’t measure it, you can’t manage it”. His point is that for any business process, including training, unless you implement a system of measurement to keep track of how well that process is functioning, there is no way to improve the process. Only through measurement can we determine whether changes to a process have been beneficial or detrimental. So measurement is a core feature of any CI process. In order to measure something, we first need to establish a set of “Key Performance Indicators” or KPIs which will be measured and tracked. These are indicators of effectiveness and efficiency which provide a measurement of “key” or important aspects of training - those aspects which are worth optimizing. For example, if one goal is to create a positive educational culture in your maritime organization, trainee satisfaction with the training process is an important element to optimize. We would then choose a KPI which attempts to measure that aspect as closely as possible. • Can be directly measured. Some important parts of any process are difficult or impossible to measure because data is either not easily available, or because there are too many confounding factors which make it difficult to isolate a particular indicator. • The organization has control over. Even if it can be measured, there may be little point, at least for the purposes of CI, if there is no easy way to influence the metric. Another consideration is to choose KPIs which react reasonably quickly to changes made to training practices. For example, although “days without safety incident” is a critical KPI for any maritime organization, the value is not likely to change quickly with small changes in training. Therefore as a training KPI it may not be useful because it will be hard to relate changes in this KPI to specific changes in training. However, if we take care of the “little” things with carefully chosen KPIs (like lifeboat drill frequency and effectiveness) the “big” things (like overall company safety) will take care of themselves. At each iteration of the cycle, training changes which have improved the KPIs are kept, and those which have had no or negative effect are removed. The period of your CI cycle (the length of time that each cycle lasts) is determined by the organization’s ability to collect meaningful metrics and implement proposed changes. Depending on the size of an organization and the number of people it trains, this might be anywhere from 6 months to a year or more. Remember, however, that CI is generally a process of making small changes, and that it is generally unwise to make too many changes during any one cycle since it may be difficult to determine which change affected the KPIs. Therefore, shorter periods, as long as they allow for meaningful measurement, will create a training organization which is more responsive to trainee and organizational needs, and which can make quick course corrections when a change is found to be detrimental rather than beneficial. • Reviewing the KPIs to make sure they optimally capture the aspects of performance most important to the training organization. In other words - do we have the right KPIs? Should any new ones be added? Should any existing KPIs be deleted or altered? • Review the period of the CI cycle to ensure it is neither too long nor too short. • Review performance in terms of success in being able implement changes that the organization felt were necessary. • Review performance in terms of how well the changes made in the past improved the training KPIs. By doing this you are applying the philosophy of continuous improvement not only to training, but also to the system which ensures the continuous improvement of training. In the February edition of Maritime Reporter and Engineering News we turn our attention to specific CI techniques which can be applied to maritime training. To do so, we will look at KPIs that are useful in this environment, and how to gather those KPIs. Until then, happy New Year and keep safe! Murray Goldberg is CEO of Marine Learning Systems (www.MarineLS.com). An eLearning researcher and developer, his software has been used by 14 million people worldwide.